IT budget had been bad since the recent U.S economy crisis - based on my involvement with the media and IT industry, I saw that big IT companies were having difficulties acquiring new customers - big trends like cloud computing, big data, SDN fell shorter than expected - nobody was willing to acquire new technologies overnight in order to meet trends. I could be wrong, nonetheless, based on my own data and observations, it couldn't go too wide out - correct me if I am wrong !!! The downsizing of IT industry actually started since the crashed of dotcom and the Malaysian economy crisis in 1997, when it almost wiped out all IT departments gradually as years moved on. I knew this as a graduate in May 2002, when I was employed as a programmer for a public listed manufacturing company based in KL with the minimum pay only - we had to work long hours as ever. During that time, we were part of the IT department of the company. Hence, apart of developing the in-house ERP solution, the IT team was also responsible to deal with all other IT related tasks such as fixing printers, computer networking, checking out the Internet connections, commissioning and decommissioning PCs, servers and etc. A few years down the road, such IT departments were no longer in existence - with the exception of bigger companies. 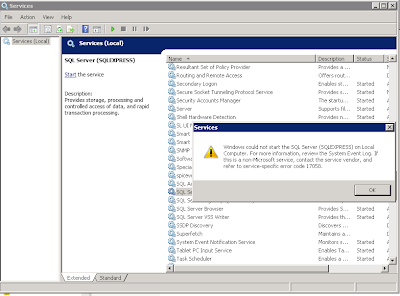 These days, IT departments are usually merged with finance, admin or operations departments and all your PC and server issues will be handled either by the vendors directly, otherwise, by outsourced service providers - sometimes these services are even rendered FOC as complimentary services. As the matter of fact, my supervisor during my first job as programmer stated above was the finance manager; we never had a real IT manager. Many predicted that 2013 was going to be a low-profile year for IT adoption, mostly driven by the sentiment of the instability of economies from U.S and Europe. Now that we are expecting Christmas 2014 in less than a month, it looks like 2013 and 2014 is not going to look great for Malaysian scene either. 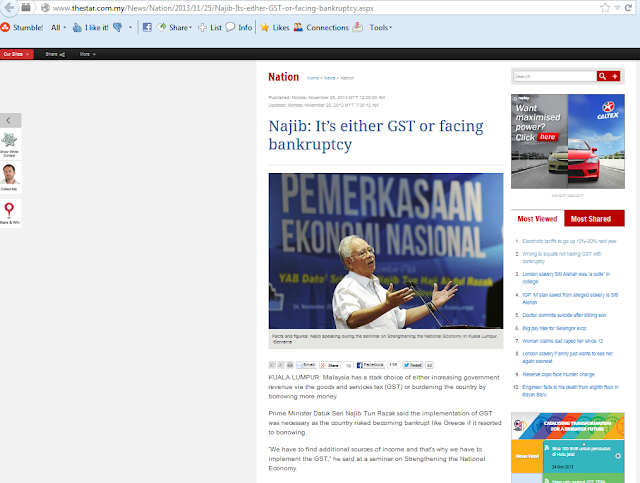 First of all, the long anticipated GST implementation had finally been announced during the recent budget 2014 that it will be enforced by April 2015. Few days ago; TheStar,http://www.thestar.com.my/News/Nation/2013/11/25/Najib-Its-either-GST-or-facing-bankruptcy.aspx,no-follow; reported that Prime Minister has finally admitted that Malaysia is likely to suffer the fate of Greece's bankruptcy if the GST is not going to happen. 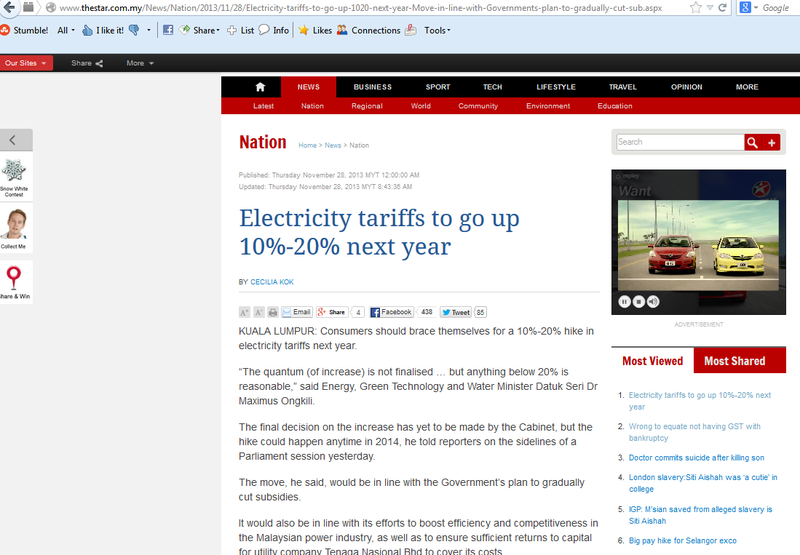 I thank PM for that declaration, even though I believe that the knee jerk reaction hasn't begun yet. 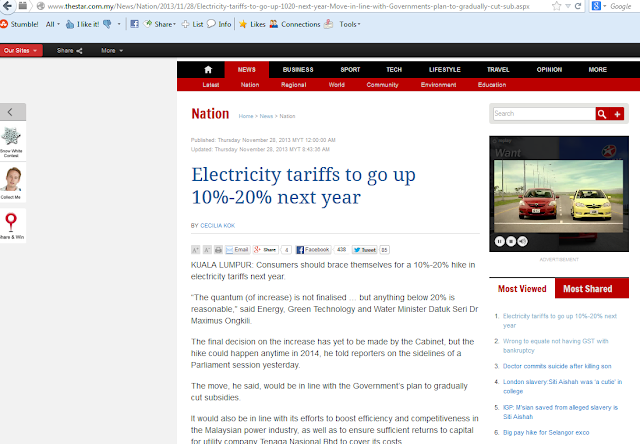 Today; TheStar,http://www.thestar.com.my/News/Nation/2013/11/28/Electricity-tariffs-to-go-up-1020-next-year-Move-in-line-with-Governments-plan-to-gradually-cut-sub.aspx,no-follow; reported that Electricity tariffs to go up 10%-20% next year, as a moving forward strategy by the federal government to cut subsidies. 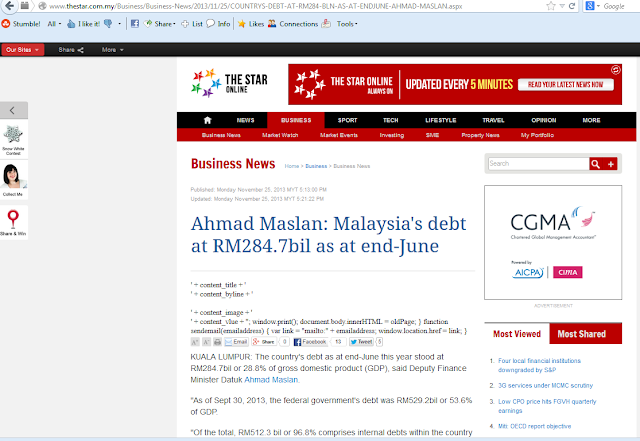 A recent report by; TheStar,http://www.thestar.com.my/Business/Business-News/2013/11/25/COUNTRYS-DEBT-AT-RM284-BLN-AS-AT-ENDJUNE-AHMAD-MASLAN.aspx,no-follow; reported that Malaysia's debt was RM284.7bil as at end-June 2013. Hence, the IT industry in Malaysia looks to go into conundrum by mid 2014 to end of 2015 - let's hope that things will come out better - let's hope that people will adopt more cloud computing, big data and SDN. Work out strategies earlier, prepare for the storm. Correct me if I am wrong - thank you.